I am on a bathroom kick today, so just thougt I would share my latest loves. 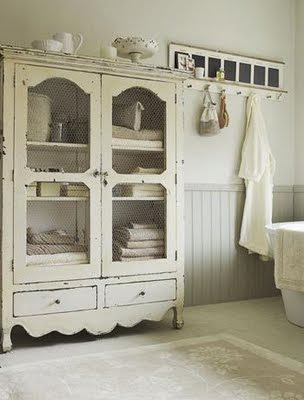 I have 3 bathrooms that are in desperate need of a makeover...so I am always on the hunt for inspiration. I love all of these...hope you will enjoy them as much as I do! I am c-r-a-z-y about the color palette in this one. I am all about neutrals and natural pine. It is just soooo "me". I am seriously considering this look for my main bathroom. But I am not sure if I have the heart to cut open the top of a gorgeous old pine dresser. Everthing just looks so casual and comfortable. I like things that are not too fussy. I can almost feel the summer breeze blowing through the window when I look at this bathroom. I would just die to have a bathroom this large! If I put a cabinet like this in mine, I would not be able to walk in the door! LOVE the grey walls and of course...the chandi! Oh, and the whitewashed floors. My flooring guy thought I was such a nut the other day when I called for a quote to whitewash my oak floors. What does he know, anyway?? Loving this cabinet...I think I may have to do one for my show in May like this. The chicken-wire front is fabulous! 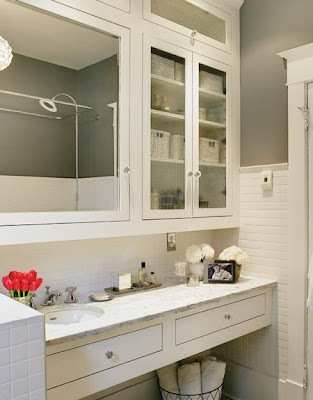 And the storage in this bath - WOW! I would love to have all those cupboards and cabinet doors to hide things behind! Oh, and of course...I am swoony over the grey walls. This bath is my inspiration for my basement bathroom. I can't wait to do the beadboard walls...galvanized light fixtures...old farm sink. Love, love, love it! I am a girl that is crazy about old metal...and the top of this vanity makes me just plain giddy! I need to find one. This is not a want. This is a NEED! 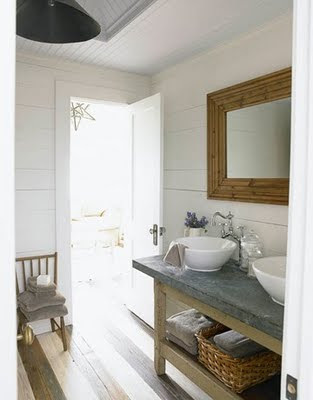 I really think I am going to end up with beadboard ceiling in every room of my house, too! Back to reality...I have to go clean the ugly bathrooms I have....and stop dreaming about the one's I don't. After bathroom duty and a little laundry...I am off to paint a french-style entertainment center and the most gorgeous french-style bedroom set. Anyone out there shopping for a little girl's furniture? This bedroom set makes me wish I had one. A french armoire, sleigh bed, nightstand and vanity with a gorgeous bench that is soon to be painted a beautiful soft, off-white. It will be at the show in St. Charles, IL in May! Those bathrooms are just GORGEOUS! I am in bathroom mode too, working on my guest bath right now... if only I could start from scratch. Thanks for the inspiration, can't wait to see what you come up with! oh Mary. i swear we are kindred spirits, I love all of these photos, the metal counter, the beadboard walls and ceiling, the farm sinks, the not too foofyness...it is all perfect!! And then when you loved the chicken wire on that amazing cabinet, I was like she did not just say that, I have been looking for a buffet with cabinets on top with chicken wire...white with natural wood counter space! ohhh goodness, we would be fighting at the flea if we went together! All of the images are fabulous, Mary! I like the idea of white washing your floors, but in the course of re~doing my family room and 2nd bath, I have found that men DO NOT like to touch wood with paint! I did however, finally coax my husband into letting me paint the wood trim white. And coincidentally, the bath is going to be a pale gray called Teardrop. I will be posting about it. Those are all so pretty. 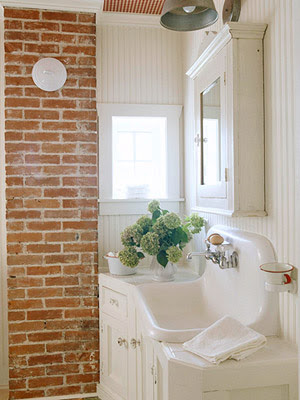 My favorite is the one with the farmhouse sink and brick wall! I just saw an old oak dresser with a sink in it at Restore for $30. The sink was cracked and so would need to be replaced. Not that I need it or have room for it. I was just thinking about how it could be painted white, distressed, new sink added and glass handles...but since I don;t need it, I passed. I did get some other cool stuff I am bringing to Grayslake though. Coming? I too am always looking for bathroom inspiration photos as we are going to tackle our upstairs bathroom very soon. It only has a clawfoot tub, no shower, so we are going to try and incorporate a shower. These are great. Fabulous bathrooms, we are currently on working on the last one on this house. Love all the grey and think that I may have to use it in a bathroom the new house. I am mad about grey at present and am currently painting a pair of louis chairs with a fabulous grey from Farrow & Ball. Beautiful! I am in love with the first two pics and the one with the brick wall... so cozy and fresh all at the same time! The photo's are beautiful. I too dream of pretty bathrooms. Ours are nothing to speak about. The gray walls are so nice as well. They're all gorgeous, but I love love love the one with the brick in it! This bathrooms are so yummy! I am tired of my cookie cutter house bathrooms, yucky vinyl tubs!! I think you can buy sheets of galvanized metal and have it put on whatever you want! Love those bathrooms. Have to warn you about wooden top converted vanities though, we had an antique one in our main bathroom from the previous owner and the wood had completely rotted out around the taps from the water. Have since replaced with a marble top vanity, much easier to clean too! Love your beautiful, inspiring images! The first two are my favorites. Have a great weekend, Mary. xo Your blog is lovely! I just found your beautiful blog from Tammy at Tinsel and Company. I cannot wait to look thru your older posts. This just helped me realize I want a galvanized table for the middle of my greenhouse. Every one of those rooms is to die for. Gorgeous. Oh my! These are gorgeous! We need to redo our master bath big time, I can just dream right! Have a great weekend!